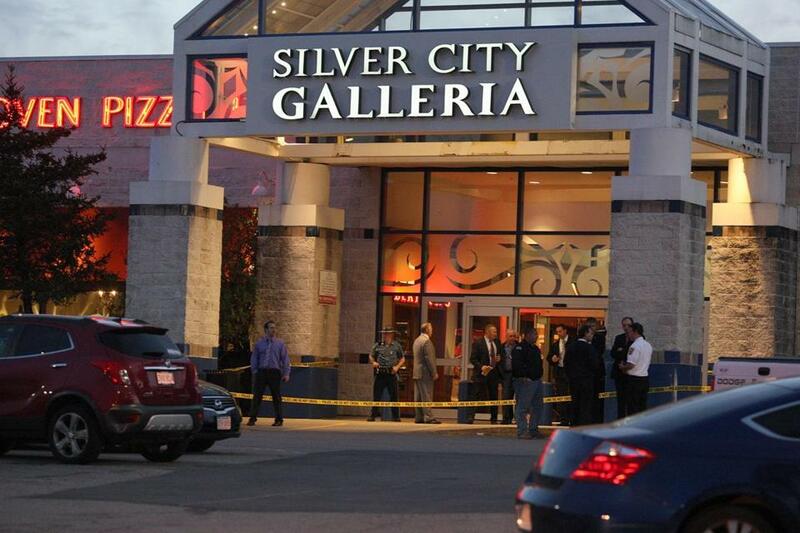 Officials surrounded an entrance to Silver City Galleria in Taunton on Tuesday evening. This story was reported by Travis Andersen and Jan Ransom of the Globe staff and Globe correspondents Olivia Arnold, Lauren Fox, and George Rizer. TAUNTON — Two people were stabbed to death, including an 80-year-old woman, and their assailant was killed by an off-duty sheriff’s deputy in a spree of violence that began at a home in Taunton and spilled over into the Silver City Galleria mall Tuesday evening, State Police said. In all, four people were stabbed in the attacks, and two of the victims died, according to State Police. The suspect, Arthur J. DaRosa, 28, of Taunton, was shot and killed at the mall by an off-duty Plymouth County sheriff’s deputy, authorities said. “He is a hero,” said David Procopio, a spokesman for State Police. The mall was placed in lockdown shortly after the chaotic series of events. At one point, the suspect ran into a mall restaurant armed with a knife. Authorities said they do not believe DaRosa knew any of the victims. The bloodshed began about 4 miles away from the mall, when DaRosa crashed his car into a truck on Myricks Street at about 7 p.m., Bristol District Attorney Thomas M. Quinn III said at a press conference. Authorities are investigating a spree of violence that erupted Tuesday. DaRosa exited the vehicle and entered a home on Myricks Street and stabbed two women, who were taken to Morton Hospital, the district attorney said. One of those victims was the 80-year-old woman who died, he said, and her adult daughter was being treated for life-threatening injuries. They were not identified. DaRosa then traveled a short distance to the galleria and smashed his car into the entrance of a Macy’s store, where he got out and assaulted patrons, Quinn said. From there he ran into a Bertucci’s restaurant in the mall, armed himself, and stabbed two more people — a man and a woman. Both were taken to Morton Hospital and one of them, a 56-year-old Taunton man, died, according to Quinn. Those victims also were not identified. It was at Bertucci’s that the sheriff’s deputy shot DaRosa, Quinn said. “I want to extend my heartfelt prayers and sympathies to the victims of this horrific violence,” he said. 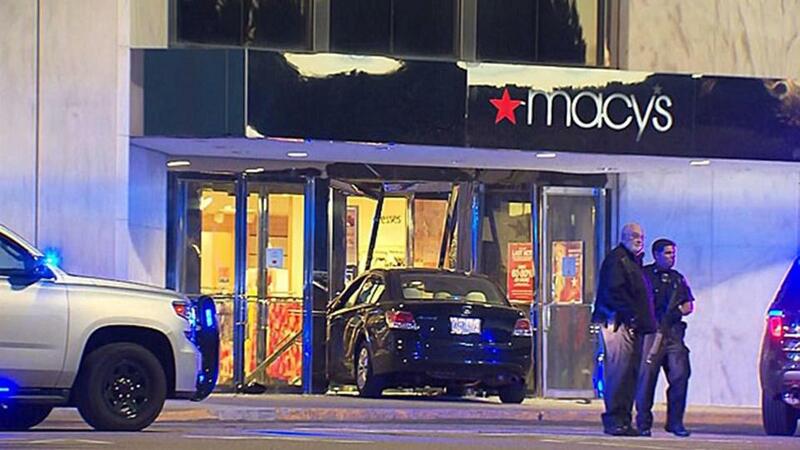 The suspect crashed his car into the entrance of a Macy’s after stabbing two women at a home nearby, authorities said. 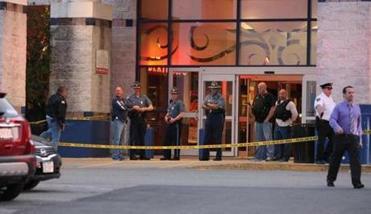 Dozens of Taunton and State Police officers remained at the scene into the night at the mall. Around the corner from Bertucci’s was the vehicle that had slammed into Macy’s. The black compact car was taken from the scene shortly before 11 p.m. on a flatbed truck. It had significant front-end damage. The mall entrance was sealed off with police tape, and an officer holding a high-grade rifle directed reporters to an area far from the scene on the opposite side of the parking lot. Justin Pizarro, 19, was working at a store in the mall at the time of the stabbings. He said a security guard walked up to him about 6:50 p.m. and told him to close the gate of his store. At about 7:10 p.m., Pizarro learned there had been stabbings after receiving a phone call from people at home who were watching the news. Late Thursday night, State Police had blocked off Myricks Street. A large sign with a flashing arrow signaled drivers to turn around in the parking lot of Star Drive-In, a diner at 205 Myricks St.
“I saw ambulances and fire trucks and cops going by,” he said. globe.com. Follow her on Twitter at @Jan_Ransom.